Since we leave for Vegas and Mesquite this Friday and (mostly) because I want to go to the "Busted Cherry" Run-One hash in Traverse City on the hash bus when we return I decided I was going to need something better than the crappy pillows sometimes provided for you by the airline. Thus a new project and experiment is born. Oh, our plane arrives Saturday morning at 5am from Vegas and the hash bus leaves at 8am... now you see why I'm thinking of ways to get the most rest possible! At first I was going to sew a U-shaped pillow, but in Googling the net I came across this "Travel N' Sleep" web site and decided I liked the concept so I'd try making a travel pillow like that instead. I was also originally going to make a pillow case for the pillow, but after a couple mock experimental ones, I decided that a pillow case wouldn't really fit this thing all that well anyway. 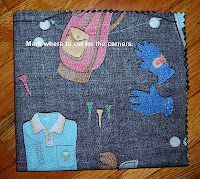 Cut 2 pieces of fabric (cotton blend works well) to about 12x11" each. Fold longer side in half with the right side facing out so now it measures 6x11". Then mark 2 parallel lines (for those that don't remember what that is it means 2 lines of equal distance from each other so no they don't cross). The lines should be 2" apart so the easiest way to measure that is to measure 1" from the fold and make a mark then flip the folded material and again mark 1" from the fold. 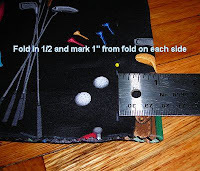 Use a sewing hem marking pencil thing so it doesn't leave permanent marks on the front side. Fold the material into 4ths (you'll fold it twice into a square) with the wrong side up while noting which side is the longer side and miter the 4 loose corners at the long edge (no folds) from about 1.5" away from edge and about 1/2" in. This is not rocket science; you just want to create a slight angle so the finished pillow doesn't have "dog ears". Next you want to cut again at the long edge but you want to cut about 1/4-1/2" below the top in toward that line you drew and at the same time create an angle from the end of the straight cut toward the top of the long edge. You'll just have to look at the picture because it's hard to explain. When you unfold it the piece will sorrrrrt of look like a bone shape on both long edges. Place the piece you just cut face down onto the uncut piece which is face up. So the right sides of the fabric are facing each other. 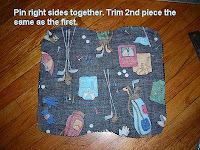 Pin them together then trim the 2nd piece to match the one you just cut. Time to sew. You'll want to leave about a 4-4 1/2 " opening in the top of the pillow so you'll have room to get your hand in there. Some people can push the filling into the pillow, but I like to be able to fit my hand. I must say though that I might try something different on the next pillow. Anyway the 4" opening should be that space between the 2 lines you drew. So starting 2" or so from the center of a long edge sew a 1/2" seam starting away from the center of the pillow and ending about 4" from the beginning of the seam on the same edge. So 3 sides are completely sewn shut and there's a 4" opening in the 4th edge. I tend to sew a little closer than 1/2" I guess because I use the pinking shears (the scissors that make that funny zigzag cut) so I don't do this, but you are suppose to snip off the corners to about 1/8 of an inch which helps the corners come out nicer. Reach inside the pillow and pull the far away corners through the hole so that the pillow is now right side out. Poke the corners a bit to get them fully turned the right way. I might make a change in this in a bit after I do the second pillow, but for now I'm saying to sew up those middle lines about 2/3 the way starting at the long edge that is already completely sewn shut. You are creating the inner seam for each pillow. Stuff each side of the pillow somewhat firmly making sure to get that stuffing down into the corners. Kneed and pull at the filling to get rid of lumps and voids. 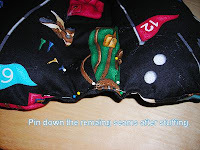 Squish the filling over as best you can and pin down the remainder of the line that runs between the two pillow pockets and finish both seam lines. Fold in and pin down the opening in the top and sew it shut trying to keep the needle as close to the edge of the fold as possible.